It’s fair to say Elon Musk isn’t your typical CEO. We don’t just mean sending a car in to space on a rocket (or three). While this is impressive, especially when you consider the car and the rockets, were all developed by his companies, the reason Musk isn’t like a lot of other top leaders is because he’s always looking to do something new and different, and thinks about what is possible rather than what isn’t. Even in his university days, a young Musk showed his entrepreneurial streak by renting a 10-bedroom house with one of his friends and turned it into a nightclub (albeit an unofficial one) charging $5 entry. After dropping out of Stanford a few years later, a young Musk started to show his refusal to stick to the script by demanding to become CEO of Zip2 – a web software company started with his brother – after securing some big contracts. When the board refused, he sold his share for a cool $22m dollars. It was after this that Musk really showed why he’s different. He started SpaceX with the intention of eventually being able to colonise Mars. Then came Tesla, and Musk’s dream of producing a mainstream electric car. To most of the outside world, these were seen as little more than vanity project doomed to failure. NASA were the big boys in space travel and hadn’t managed what he wanted to, and none of the major motor manufacturers had produced a viable electric vehicle. 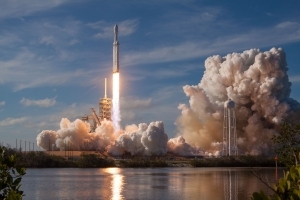 Fast forward 10 – 15 years and the Tesla Model S is the first all-electric car to be given the highest ever safety ratings by two US governing bodies, and NASA has replaced the Space Shuttle with a SpaceX produced vehicle to ferry astronauts to and from the International Space Station. Although these ‘vanity projects’ have proved to be successful, an interview with Musk in 2013 revealed that he thought the two organisations would probably fail, but that he had to try anyway. This says a lot about his outlook and why he’s not your average CEO – he doesn’t have the fear of failure. To him, the ‘we’ve always done it this way’ mindset simply doesn’t exist. This outlook and his fervent imagination means Musk even has an idea for a completely new, fifth mode of transport. The ‘Hyperloop’ high-speed transit would be energy efficient (solar powered), immune to weather and impossible to crash. It could also transport passengers between London and Birmingham in around eight minutes. It’s a concept at the minute, but who’d bet against it becoming a reality at some point? To Elon Musk, it’s about playing the long game. There might be initial failure and obstacles to overcome, but he doesn’t worry about that. He often gets his target dates wrong too but hits them eventually – usually being the first person (or company) to do whatever it is. He sees himself as a trailblazer and hopes others will follow him. He also thinks about consumers and how what he does affects them. Musk believes the human race will need to inhabit an alternative planet in the future and our oil reserves will run out at some point meaning we’ll drive electric cars. We’re all his customers and he thinks about ‘us’ constantly. So, could CEOs from other organisations learn from the man who, quite literally, shoots for the stars? Definitely. Not being afraid to fail and trying something new, having big plans and looking to the future are qualities that will have a positive effect on any organisation. You don’t need to send a car into space on a homemade rocket to do this, but a little change or shift in mindset will help.